I joined experts to discuss heritage complications. 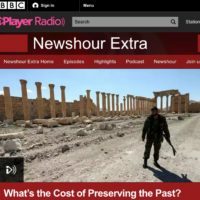 Last night I had the honour of appearing on a a BBC World Service panel for Newshour Extra. Along with with an esteemed group of experts, we discussed the more difficult aspects of preserving the past with host Owen Bennett Jones and the audience. Not quite the drawbacks but the intense complications. You can listen to or download the 50 minute programme here.